This low fat salad is ideal for picnics or alfresco entertaining, can be served with crusty white bread. Cut the chicken fillets into bite-sized pieces and transfer to a large bowl. Cut the cucumber in half lengthways and run a teaspoon down the centre to scoop out the seeds, then thinly slice into crescents. Finely slice the salad onions. Add the cucumber and salad onions to the bowl with about half the coriander. Season generously. 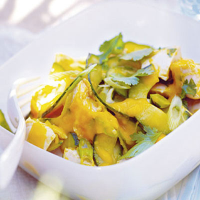 To make the dressing, peel the mangoes, cut the flesh away from the stones and slice into large chunks. Purée in a blender or food processor with the lime juice and oil, until smooth. Drizzle the chicken mixture with the mango and lime dressing and gently stir so that everything is evenly coated. Garnish with the remaining coriander and serve with crusty white bread and a handful of watercress. If you prefer, you could replace the cooked chicken breasts with a Rannoch Smoked Cooked Chicken (about 1.1kg) or a 900g Waitrose Whole Roast Chicken, from the deli chiller cabinet. Chardonnay is a good match for chicken, and New World examples tend to have more tropical fruit flavours.